This summer's motorhome trip lasted six weeks and a day (but who's counting! ), which is the longest we've ever been away from home. We really missed our house, yard, cats, friends, and everything else familiar with being home. Personally speaking, by the last week, I was very anxious to get home! 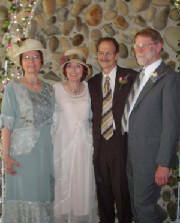 Our travel plans were made first and foremost to accommodate attending two family weddings; one for my sister Ruth and her fiancé Dan in Sacramento; and the other for my grandson Jeremy and his fiancée Crystal in Milwaukee. They were only two weeks apart and many miles between them, so the first part of our trip was primarily focused on getting to both locations in enough time. It was wonderful to see my sister and Dan get married; to meet new friends and extended family members; and of course, to again see nephews and nieces that I hadn't seen in a while. We had a short, but very pleasant visit to Sacramento. After my sister's wedding in Sacramento and before going to Milwaukee, we spent Memorial Day weekend in Hannibal, Missouri. 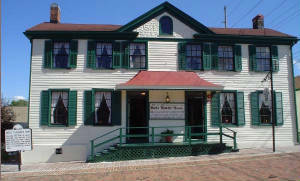 This is the boyhood hometown of Samuel Clemens, who later became the famous author, Mark Twain. 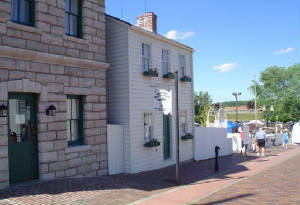 Downtown Hannibal is the historic section of town that includes the homes of Mark Twain and his childhood sweetheart, Laura Hawkins (who was depicted as Becky Thatcher in his books); the law office of J.M. 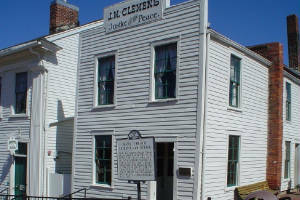 (John Marshall) Clemems, Mark Twain's father; and several other historic buildings of that time. 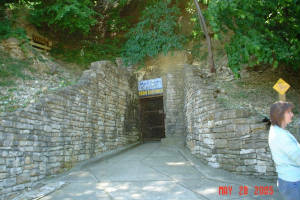 Besides seeing the historic homes, one of the other major attractions to Hannibal is touring the Mark Twain Cave. 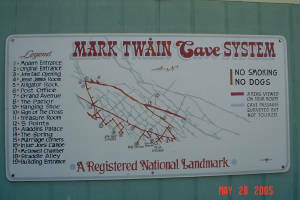 This is the very same cave that he wrote about in his books, and also where he and Laura and his other friends actually explored, played, and even got lost for a day. When you see the map of the cave system and take the tour, you can easily understand how anyone could get lost in there! The cave now has the luxury of electric lighting, but all they had then were candles to light their way.